Bumbet is an online casino that specifically caters to the Brazilian market, while also accepting players from other Latin American countries including Argentina, Chile, Columbia, Ecuador and Venezuela. The site is available in English, Spanish and Portuguese and uses a distinctly Brazilian theme showcasing beautiful bikini-clad models. We’ve thoroughly tested the casino site and delved into its terms and conditions to see what Bumbet has to offer real money players – read on to find out more and see our final verdict. $450 Slots Bonus – Sign up and make a real money deposit to get a 100% matched deposit bonus up to USD $450 (or currency equivalent). This bonus money can be used on any of the online slot games or video poker titles across Bumbet Casino, excluding progressive jackpot games. $150 Table Game Bonus – Sign up and make a real money deposit to get a 100% matched deposit bonus up to USD $150 (or currency equivalent). This bonus money can be used on any of Bumbet’s table games. $65 Bitcoin Bonus – Sign up and make your first real money deposit using Bitcoin to receive a 100% matched deposit bonus up to USD $65 (or currency equivalent). If you’re interested in online sports betting, there’s also a separate welcome bonus available for sports bettors using Bumbet’s online bookie site. Note: All bonus offers come with a 40X wagering requirement before any winnings earned from the bonus money can be withdrawn. These bonus offers are only available to players from Latin American countries, excluding Brazil. Signing up for an account at Bumbet is as easy as clicking ‘Join Now’ and filling in basic personal information like your name, address, date of birth and phone number, and creating a username and password. It only takes a few minutes to register and you’ll be given the option along the way to make your first real money deposit. If you’d rather later, return to your account at any time and click the dollar symbol to make a deposit at any time. 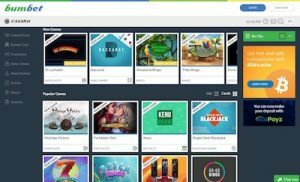 Bumbet is an instant-play casino, so games can be played directly over your Web browser without any downloads needed. Games are also available to play for free in practice mode, but only when you’re not logged in to your casino account, so you will need to sign out if you want to trial any of the games with no risk to your bankroll. A mobile Bumbet Casino site is also available for those who prefer to play on the go using a smartphone or tablet. The mobile site is also fully available for instant-play, so you don’t need to download any apps to play for real money. The mobile casino site is well laid out and offers a good selection of some of the most popular games found at the full desktop site – all you need is a reliable, secure Wi-Fi, 3G or 4G connection and you can access games on all major smartphone and tablet makes and models. There are hundreds of slots to choose from, along with most common table game variants including roulette, blackjack, craps, baccarat, rummy and more. Bumbet does not offer live dealer casino games. Note that the payment methods available will depending on which country you’re playing from – you’ll have to log in to your account or check with a live chat operator for full information about the payment methods available to you. If your local currency is not accepted, deposits will be subject to a 3% currency conversion fee, unless you’re depositing with Bitcoin, which attracts on additional fees. Withdrawals can only be made using the same payment method you used to make your deposit, so choose your deposit method wisely. If you deposit using a credit card, you can only use Wire Transfer or Visa Fast Funds to withdraw your cash. All withdrawals are limited to $1000 per transaction, except for withdrawals using Visa Fast Funds which are limited to $500. Users are limited to one withdrawal every seven days, unless you’re using Wire Transfer, which are limited to one withdrawal per month. Bumbet is licensed and regulated by BSports Media and N. V. Under License Games 2015-034. The brand also holds a license from Curacao eGaming under licensed number 1668/JAZ. All transactions across the site are protected by 128 Bit SSL (secure socket layer) digital encryption security, so you can be comfortable entering personal and financial information while knowing your information is protected. Help is available at Bumbet Casino via an FAQ section, live chat, contact form or by sending your query directly to [email protected] During our testing, the live chat ques were quite long and customer service reps took a while to respond with relevant information but we did get the information we were looking for in the end. On the surface Bumbet Casino appears to be a good casino site – while it’s not the most eye-catching casino site around, the layout is attractive enough and the gaming platform is adequately user-friendly. The casino is licensed by trustworthy jurisdictions and is protected by digital encryption security. Digging a little deeper and we start to see the casinos flaws, discovering inconsistencies in some of the information provided in the advertisements versus the fine print. While the bonus offers are tempting, they also come with a 40X wagering requirement which is up there with the higher play-through requirements found at our recommended casino sites. The casino also has low deposit and withdrawal limits, which may be a deterrent to high rollers. The plus side is that Bumbet caters to players from South American countries like Argentina, Brazil, Chile, Columbia, Ecuador and Venezuela, which aren’t often serviced by reputable casino brands. Unfortunately for Brazilian players, the welcome bonuses are not available, which is confusing given this site is designed to cater specifically to Brazil. In the end, Bumbet is worth giving a go if you’re from any of the countries mentioned above so you can decide for yourself whether this casino is up to your standards.